LANSING, Mich. - Gov. Rick Snyder joined State Sen. Joe Hune, State Rep. Pete Lund and business leaders to announce a plan for no-fault auto insurance reform that will lower the cost of insurance for Michigan drivers, continue to provide the best catastrophic injury protection in the nation and ensure a fair and sustainable system into the future. The plan calls for an end to the requirement that consumers purchase unlimited lifetime medical coverage, the only state to mandate such. Under the proposal, Michigan's mandatory coverage for catastrophic accident victims would continue to be the best in the nation, providing $1 million in coverage, more than 20 times the next highest state. Creating responsible, sustainable cost controls is estimated to lower insurance premiums by $250/year for the average Michigan family. "Michigan has some of the highest insurance rates in the country, and it's our own fault," said House Insurance Committee Chairman Pete Lund, R-Shelby Township. "We have an outdated, expensive and unsustainable insurance mandate that puts an incredible burden on Michigan families trying to make ends meet. The hard-working people of this state need and deserve relief." The legislation will end the practice of medical providers charging more for auto-related injuries, limiting payments to the same average fees they charge other insurances. The average auto insurance medical claim in Michigan is more than $45,000, twice as high as the next closest no-fault state. These additional costs have been passed on to consumers through higher insurance premiums. To combat the prevalence of auto insurance fraud that leads to increased costs for everyone, a fraud authority will be established, funded by insurance providers. The authority will provide grant funding to agencies charged with combating fraud and will establish a central repository for fraud data. The ever-increasing auto insurance rates have put the mandatory coverage out of reach for many citizens. Nearly one in every five drivers in the state does not have proper insurance, another contributor to high premiums. "I have been working on this issue since 2003 and I am proud to say that the residents of Michigan will finally see some relief in their auto insurance premiums," said Sen. Hune. Michigan has three cities in the top ten highest auto insurance premiums in the nation and the rate of uninsured in urban areas is estimated as high as 50 percent. Proposed companion legislation by Sen. Virgil Smith will help tackle the need for affordable insurance in Michigan cities by establishing a pilot program for eligible low-income drivers to purchase a low cost policy. The program would allow medical coverage to be purchased at $50,000 to lower the cost even further. The Michigan Catastrophic Claims Association (MCCA) would be phased out and replaced by a non-profit entity that would be subject to full transparency. The existing MCCA will continue to ensure that all current accident victims receive unlimited, lifetime benefits from their insurance company. The package will also include a solution to the $1.2 billion Medicaid shortfall created by the shortfall and sunset of the Health Insurance Claims Assessment (HICA) by including a $25 assessment for Medicaid and extending the sunset for HICA. 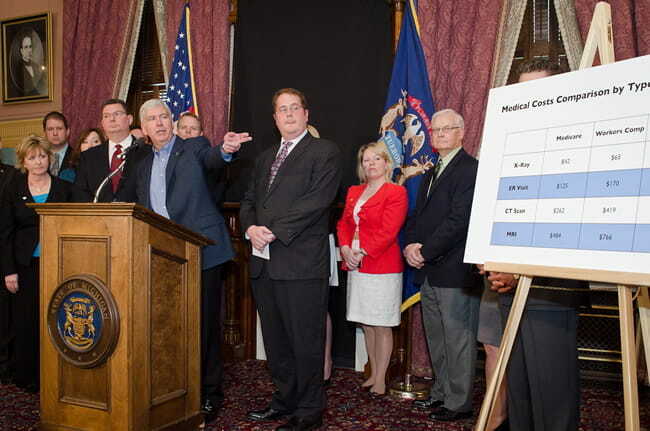 This ensures a strong safety net for vulnerable Michiganders. Legislation is expected to be introduced in the next week. Michigan is the only state to require unlimited lifetime medical benefits. At $1 million it would continue to provide the most generous benefits in the nation, 20 times higher than the requirement in the next closest state, New York at $50,000. The lack of cost controls has led to a MCCA payout averaging more than $78 million a month. The yearly payouts increased by over $200 million/year in the past five years. Michigan's average premium is more than $261 above any neighboring state and as much as much as $400 higher in some cases. The average auto insurance medical claim in Michigan has increased 230 percent in the past 12 years and is now more than twice as much as the next closest state. Medical providers often charge auto insurers more for covered services, sometimes as much as 300 to 400 percent higher than what they accept from health insurers.